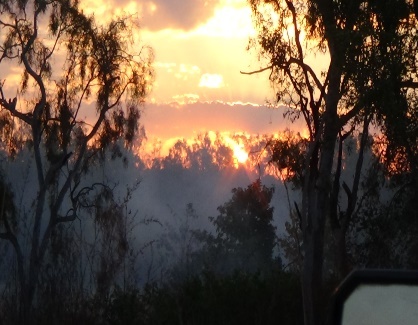 or this recent sunset during the burning off season. Marg, as manager of the shop, has to handle all sorts of customers. 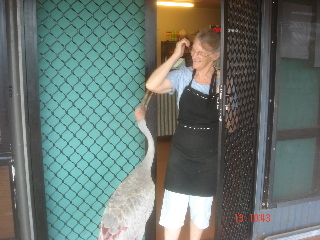 Here, Lanky the brolga, Kalumburu’s most photographed icon, is checking out the possibility of a feed. 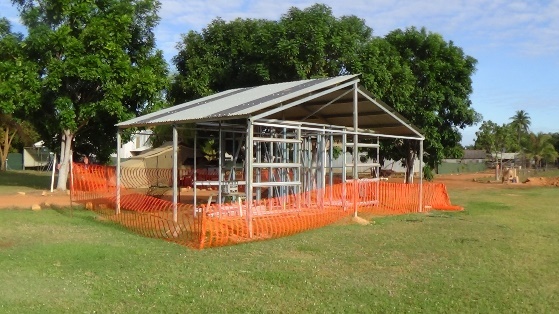 Here is the new amenities block Dave is building in the camp ground. Almost all the materials are ‘junk’ lying around after building contractors have left at completion of their jobs. Just the sort of job Dave loves. The Mission will get four new showers and toilets, including disposal systems and solar water heater for $5000 – normal cost would be $ 40 000. No wood can be used as the termites demolish it within twelve months, except for local cypress pine, which is scarce and expensive. How would you like these growing in your backyard? It has been fascinating to watch the unrolling and development of these bananas in ours. Amazingly, they start off rolled up in the opposite direction to the shape they finish up when mature. 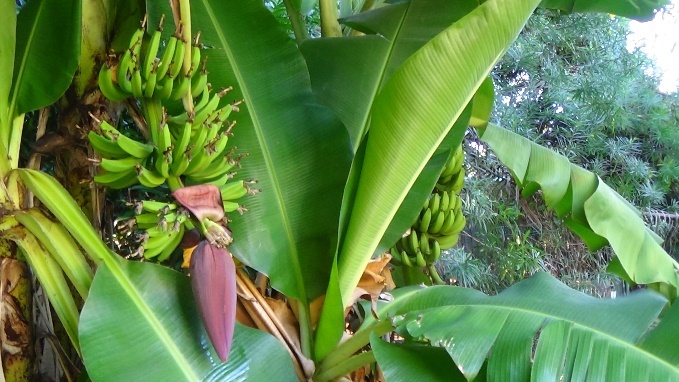 The banana trees, with their huge leaves, are tucked in amongst the coconut palms and mango trees – all fruiting at present. Then it will be a battle between the fruit bats, the aborigines and ourselves, who gets their share of the fruit. As I look through the mass of pics, trying to guess what you might want to see, I realise what a fantastic place Marg and I have been fortunate enough to spend a year in. Although we have both found it a challenge living in community with the other volunteers and amongst a people with such widely different values and attitudes to our own. We have learned to see some of our own deeply ingrained prejudices and that is not necessarily enjoyable. We don’t know what the future holds for us but we still intend to return to the cold south in December – to enjoy Christmas with family and friends. This entry was posted in Uncategorized on August 25, 2014 by Kalumburu2014. Sorry for the delay in getting to you all but we still struggle with the limitations of internet in this remote place. We hope all is well with you all and think of you every day. Our family is the only thing we miss in being so far away. All is well at this end and we hope at yours too. Mum is again manager of the shop here as the two volunteers who were supposed to do it left suddenly this week. At present we have a cooperative group of volunteers and a good boss, so life is pretty happy. Dave is looking after maintenance of the grounds and facilities of the Mission and the camp ground – back to cleaning camp toilets. Today the boss’s family, Marg and I 4WDd our way into a remote pool. 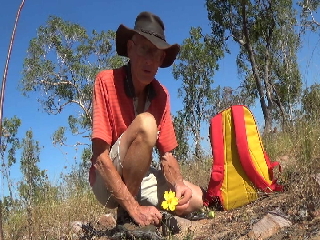 It’s really tough here in winter and we are well into the dry season, being weeks since we have seen any rain at all. The road is now open and the flow of tourists has started and, I guess, grog into the community, although we haven’t seen any signs of it yet. Dave is still struggling with computer programs that won’t talk to each other and are preventing him from putting together a film of our stay here so far. Over the next week or two, he will try to put together another illustrated letter showing the latest up here, for the blog site. This entry was posted in Uncategorized on June 4, 2014 by Kalumburu2014. The shop has gone very quiet lately as the other shop has started serving take away food and everyone is going there – price wars. Maybe it’s just as well as our last food order did not arrive on the barge, someone at the other end forgot to process it. Anyone want a job in the outback? Our manager is away at the moment with his family as one of his nine children is getting married in Broome this weekend. (When the cat is away the mice will play.) The manager is on the right in the attached pic of the current volunteers. 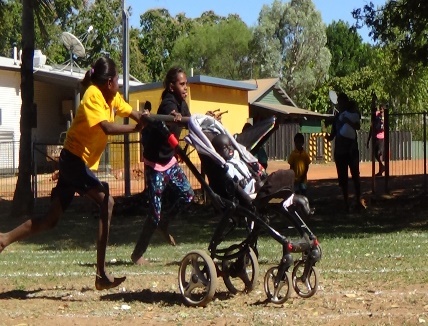 He married an aboriginal and the son getting married is also marrying an aboriginal girl, so it will be a big aboriginal wedding – they are away for a week to get over it. Weather is cooling down over night now. I even had to use a doona last night. We are all waiting for the road to be opened so the tourists will push up the business levels. With our love and prayers for God’s blessings on you all. This entry was posted in Uncategorized on May 13, 2014 by Kalumburu2014. Things are going well here with four new volunteers arriving so now there are thirteen of us and more due next week. Mum is temporarily head of the shop until the new vollies get their head around it. My maintenance team is getting bigger by the day. We are even looking at the bigger jobs which have been on hold for months. The wet season appears to have gone and the weather is cooler and less humid – all enjoying that. Just waiting for the road to be declared open. (huge fines if you travel on roads while still declared closed – like $1000 per wheel for first offence). Mum and I are cooking dinner for the mob tonight so must go and catch the croc. This entry was posted in Uncategorized on April 30, 2014 by Kalumburu2014. Things up here keep changing. One of our really useful volunteers, Brenda, left on Tuesday and a Brittish couple about our age arrived, fresh from the Swiss alps. We did a great 4WD trip with Fr Nick last Sunday with plenty of rough stuff. The only trouble with this place is the croc’s, as you can’t swim on beautiful hot days and beautiful deserted beaches – like last Sunday. I haven’t seen one yet so I wonder if they are just a big hoax. Attached are a couple of pics of our fellow inhabitants. The little goanna invaded our toilet around lunch time a couple of days and the little gecko is typical of dozens which dart around all the buildings all the time. That one was on the kitchen window. They chirp like a bird and leave their droppings everywhere. Finally, on Easter Sunday afternoon, we get to rest after all the ceremonies. Our priest needs lots of help and support to make sure they happen, even in simplified form, so we have been flat out the whole weekend. Even today, after 8am Mass we held the traditional Easter egg hunt and games for the community along with stew and rice breakfast and frozen cups of fizzie drink, which they buy to make up the ‘parish’s’ contribution to Project Compassion. Sounds like we might have made about $1500 out of that. Above pic shows Fr Nicholas, in the red shirt, drawing the raffle with the usual gaggle of kids. During this week I will try to put together more images of life here. Off now to see the locals’ fishing competition up at the barge landing ramp on the coast. We hope your Easter was satisfying and the family gathering not too inclement. Sometimes we think we would like to be home but the weather reports from Melb aren’t too enticing. It’s too easy to live up here. We have yet another two volunteers arriving here next week. The boss doesn’t know what to do with them. As the weather is continuing dry and cooler we are getting ready for the rush of tourists in another month or so. Most of my work now is in the camp ground and accommodation units (like Baanya Biami). Mum is still in the shop but not as manager (which pleases her greatly) and there are plenty of staff there, so it’s a real picnic now. Above is pic of current group of volunteers and handing out fish after Stations of the Cross on Good Friday. This is to encourage the locals not to eat meat for dinner that night. As we have a public holiday again tomorrow, I may be able to make some headway on the DVD of our adventure here.